I have had a love for the landscape since I was a young child accompanying my father, an agriculture teacher, driving the back roads on his visits to his student’s projects in the San Joaquin Valley of California. Our family also explored the National Parks in Southern Utah and California. 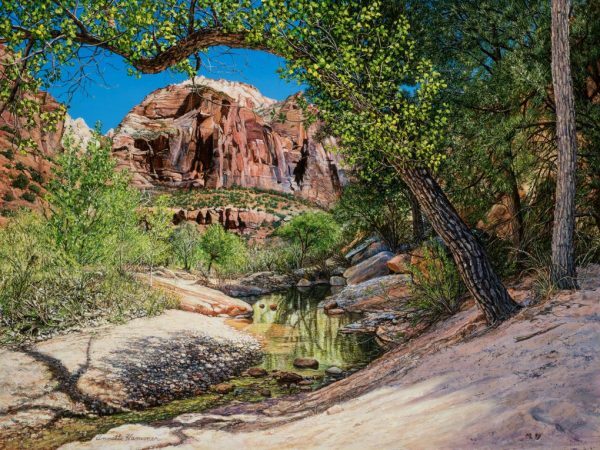 It is no surprise that many of my favorite places to paint are in these locales, as well as scenic areas of Arizona, Texas, Missouri and Colorado. The central focus of my work includes fine paintings of real places that I respond to. With each new painting comes the excitement of sharing the unique view I hold of the surrounding world. Elements that are of particular interest to me are the diversity of landscape, incorporating oaks and other trees, mountains and valleys, vineyards, cultivated farm land, cattle and horses that have played such a large part of our country’s development, and water, from small streams, rivers and lakes, to the vast oceans that border the coast. I share with the viewer the essence of discovery and the memory of a shared past. The final painting product is a combination of my critical observation, my personal appreciation for the idea and skilled application of the paint. I have been an artist for over 50 years. My painting career started as a young adult when I took my first group art class in Santa Monica, California. Now having painted for all these years, I look back on those first classes as a turning point in my life. From the beginning I noticed that I could share feelings and ideas with my viewer that I could not express in words. 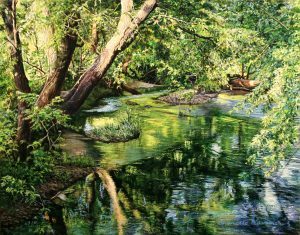 Eventually moving on to college classes to learn basics through advanced concepts I have realized that first ambition of being able to share through the creative process of oil painting, my wonder at the surrounding world. My desire to capture just a small portion of the eloquence of nature is what keeps me coming back to each new canvas. With each new painting comes the excitement of sharing my unique view of the surrounding world. Collectors who own my paintings say they feel they can step right into them, finding new areas of interest with each viewing. I ask people to search their own experience to find the same sense of awe I feel at the grandeur and beauty of the Landscape. You are not just looking at my paintings. You are there. 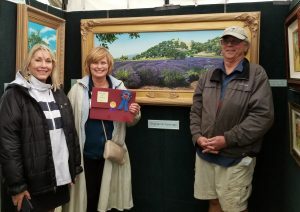 Selected as a guest artist for the Autry Museum Masters of the American West Fine Art Exhibition and Sale held each February, Ms. Hammer has been recognized for her artwork. Awards include Award of Excellence in the Pensacola Great Gulfcoast Arts Festival, Best In Show at the Big Four Bridges Arts Festival in Louisville, KY, Best of Show in Painting at the La Quinta Art Festival, Best of Show and Purchase Award, and People’s Choice Award at the San Dimas National Western Art Exhibition, Best of Show at the La Jolla Festival of Arts, and 2 years Best of Show from the Santa Monica Sports and Arts Festival, also receiving the Special Seascape award. Ms. Hammer was the first artist to be chosen by the Carnegie Art Museum in Oxnard, CA to be featured in their ongoing “Masters In our Midst” series.